Fireworks are a fun and exciting way for families, businesses and communities to celebrate a variety of occasions. They bring the night to life with bright colours and short and sharp bursts of sound. While they are dazzling and exhilarating, they are also live and dangerous. 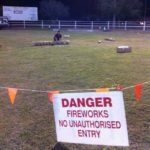 Our pyrotechnicians ensure a safe area for viewers by considering exclusion zones and site plans for each and every event. You may have noticed at our events that a large area is identified to only be suitable for our licensed operators. These areas are identified by brightly coloured bunting and large signage, requesting no unauthorised entry. These spaces allow the pyrotechnicians to prepare the display safely and inform event attendees where they can/cannot access. Although it may be appealing, it is very important not to breach these zones. Next time you are at a festival, show, wedding or concert, keep an eye out for bunting and signage similar to that seen in the attached image.